If your order weighs less than 13 ounces, save huge on shipping with USPS first class (with tracking number). This product weighs 38.2 oz. Nature’s Sunshine Mineral Chi Tonic, Chinese, blends herbs used in traditional Chinese medicine to provide an energy boost and to balance vitality. The formula includes gynostemma herb, lycii berry, schizandra berry, eleuthero root, rhizome astragalus root, deglycyrrhizinated licorice root, reishi mushroom (ganoderma), ginger rhizome, and ginkgo biloba leaf. 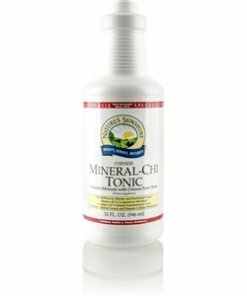 Mineral Chi Tonic capsules contain 180 mg of potassium in addition to purified water, white grape juice, glycerin, sodium benzoate, citric acid, and natural apple and cherry flavors. Instructions: Take one tablespoon (15 ml) in the morning and one tablespoon in the evening daily. May be mixed with water or juice, to taste. Purified water with liquid mineral concentrate, white grape juice, vegetable glycerin, sodium benzoate, citric acid, potassium hydroxide, natural apple and cherry flavors.